Asian Carp Found Near Lake Michigan : The Two-Way An Asian Carp was found within 10 miles of Lake Michigan, raising fears that the invasive species would soon be causing havoc in the Great Lakes. 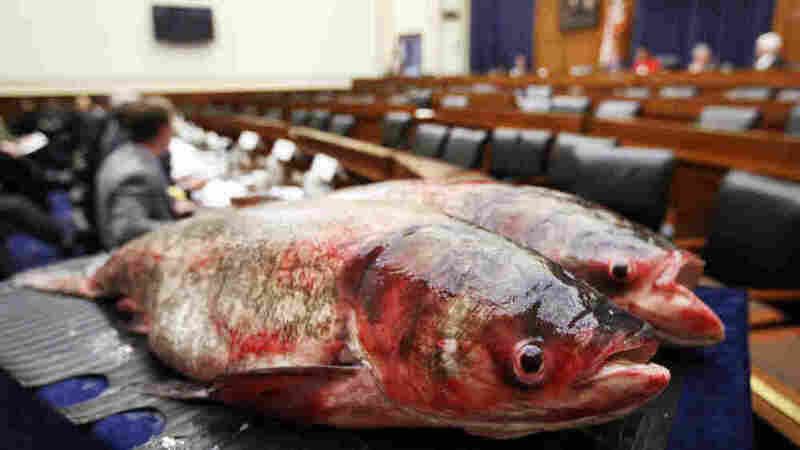 In the fight between humans and Asian Carp, the fish appear to be winning. A member of the feared invasive species was just found in Chicago's Lake Calumet which is within ten miles of Lake Michigan. And it was big, about 20 pounds. Government officials and people who make their livelihood in the Great Lakes fishing and tourism industries have worried that if the seemingly insatiable carp get into the Great Lakes they will reduce the populations of the native fish. It now seems the question is not if but when. The carp have gotten past an electrified fence meant to prevent them from getting so close to the Great Lakes. Poisoning the waters of the Chicago Sanitary and Ship Canal failed to stop the advance of the carp also. DAVID: While environmental DNA of Asian Carp had previously been detected in waterways leading into Lake Michigan, this is the first discovery of an actual live Asian Carp anywhere near entering the Great Lakes, according to John Rogner of the Illinois Department of Natural Resources. ROGNER: "This fish was about 20 pounds in weight, about 35 inches long. It was netted in Lake Calumet. Lake Calumet is connected to the Calumet River and it is immediately upstream from the O'Brien Lock and Dam and that's about six miles from Lake Michigan itself." DAVID: That means if there are other Asian Carp nearby there is nothing preventing the invasive species from getting into Lake Michigan. Scientists fear the huge, voracious Asian Carp could crowd out native species in the Great Lakes and damage a $7 billion dollar a year fishery. The Chicago Tribune's breaking news blog has many more details about this latest, worrisome development.